Similar to eyeglasses with progressive lenses, multifocal contact lenses feature a gradual transition in lens power to allow natural vision at near distances for reading and clear vision for further distances. Multifocal contact lenses are most convenient in a daily disposable, allowing the freedom of occasional use of contact lenses and progressive eyeglasses. Many multifocal daily disposable contact lenses are now available to meet the growing need for clear vision at multiple distances and advances in technology continue to improve vision and comfort. 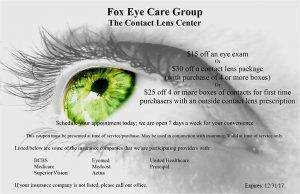 Fox Eye Care Center optometrists in Greensboro, NC spend time with each patient to fit and choose the perfect multifocal contact lens. Depending on comfort or factors such as dry eye, your eye doctor may recommend trying a particular multifocal lens. As Greensboro’s contact lens specialist, Fox Eye Care carries a complete selection of the latest daily disposable contact lenses, like the Bausch and Lomb Ultra for Presbyopia multifocal contact lens. We regularly give patients a trial pair to take home to ensure proper comfort and vision before ordering a supply for our customers.